Jennifer Lopez uploads images of her wearing top-to-toe Gucci | HELLO! January 15, 2018 - 18:35 GMT Laura Sutcliffe Jennifer Lopez looked incredible in designer outfit by Gucci which featured a ruffled pink top and gold tapered trousers by the high-end fashion brand. Jennifer Lopez has given us SERIOUS wardrobe envy this weekend – rocking an incredible, top-to-toe outfit by Gucci. There is no doubt that the Jenny from the Block singer knows exactly how to work glamour in to her enviable wardrobe, but this outfit is completely fashion forward and needs to be in our wardrobes pronto. The 49-year-old stepped out in the eclectic ensemble to film World of Dance and couldn’t resist a selection of quick Instagram snaps which her 71.1 million followers loved – hitting the ‘like’ button a whopping 1.1 million times! 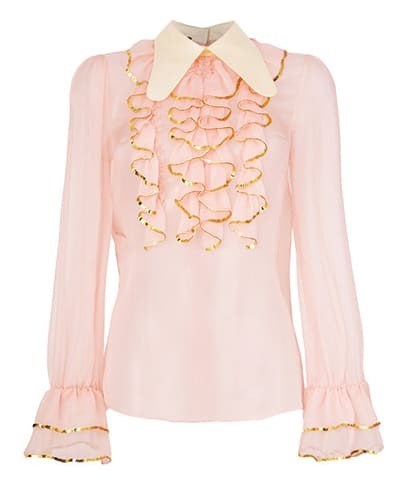 Mother of twins Max and Emme wore a beautiful blush pink blouse which featured an abundance of gold-trimmed ruffles and voluminous sleeves complete with bell cuffs. The huge collar was teamed with a large floral necklace and the Ain’t it Funny singer added her trademark accessory of delicate gold hoops. The shirt is priced at £1,300 and available to buy online now in all sizes. 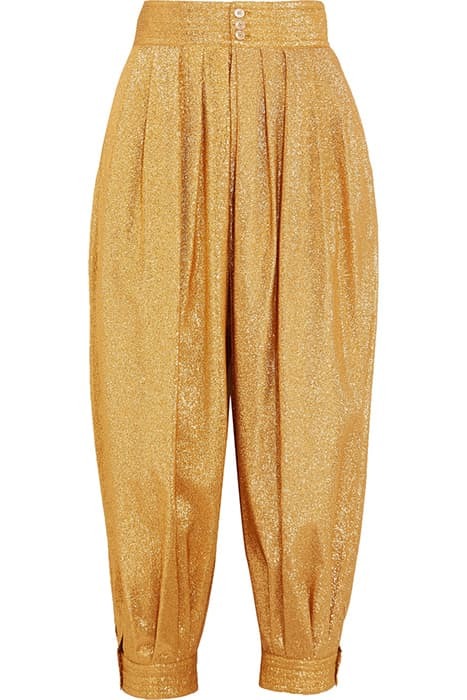 The stunning shirt worked well tucked into the waistband of her cropped textured lame tapered pants – the gauzy gold material gave the actress the Midas touch and showed-off her trim waist. Sparkly high heel platforms were the perfect stamps to top off such a dreamy ensemble. We want the entire ensemble! The former wife of Marc Antony has been showing a huge admiration for the Italian brand of late – she uploaded a stylish shot to her social media platform of her looking typically stunning – rocking a cosy white turtleneck jumper and Carrie Bradshaw-esque tulle skirt. However fans went wild for her unusual footwear choice - a pair of strappy sandals, over the top of Gucci sequined socks that could be seen beneath the layers of the skirt. The knitted socks are made in a neutral cream shade and feature a crystal interlocking 'GG' pattern that the designer brand is known for and are priced at a cool £885! Jennifer Lopez, 48, is a Guess girl!